X-Men: Apocalypse is going to be jam-packed with Mutants both old and new. But it looks like one particular fan favorite introduced in last year's X-Men: Days of Future Past is going to get some special attention. Evan Peters, who plays Quicksilver in both franchise sequels, has revealed that some of the story will focus on the relationship between the super-fast speedster and his biological dad. 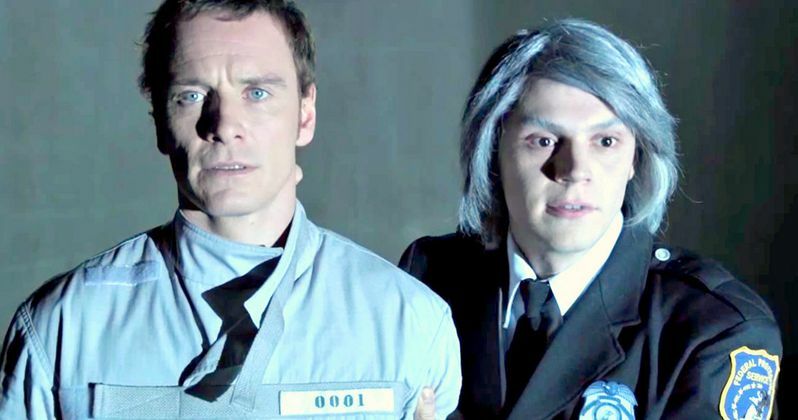 Magneto and Quicksilver were among two of the most popular characters making a scene in X-Men: Days of Future Past. But it was only ever hinted at that Magneto is a father. When the two meet back up in next summer's X-Men: Apocalypse, their destinies will be directly connected. Speaking with Details, Evan Peters had this to say about his part in the adventure. "The story is that my character is searching for his father and wants to find him. It starts there and then he jumps on the X-Men train and gets sucked up in this whole Apocalypse madness: He tries to stop him from destroying the world." X-Men: Apocalypse follows the title villain played by Oscar Isaac as he sets out to recruit his Four Horsemen and take over the world. Magneto will join Apocalypse and fight against a new set of mutants under the tutelage of Professor X and Mystique. It sounds like Quicksilver will join this conflict to help save his dad. The character, which is shared by 20th Century Fox and Marvel Studios, first made his debut in X-Men: Days of Future Past. He was recruited by Professor X, Wolverine and Beast to break Magneto out of a prison hidden underneath the Pentagon. When he learns of Magneto's powers, he mentions that his mother 'used to know' a man who could manipulate metal. It has been confirmed that in this corner of the Marvel Cinematic Universe, Magneto is in fact Quicksilver's dad. While Avengers: Age of Ultron introduced the character of Quicksilver, as played by Aaron Taylor-Johnson, that movie looked at his relationship with his sister, Scarlet Witch. Now, we'll get to explore the parental side of this equation in this franchise sequel. The story in X-Men: Apocalypse takes place 10 years after the events of X-Men: Days of Future Past, which reset the entire timeline of the series. When we meet back up with Magneto, he is hiding in Poland. He is living a normal life with a woman he loves desperately. But her loss pushes him into a world of despair and darkness, and he comes to see Apocalypse as a god-like savior of sorts, and is only too happy to join his side along with the other horsemen, which include Storm, Psylocke and Archangel. What do you think about these latest rumors? Are you excited to see the father-son relationship between Magneto and Quicksilver explored on screen?